Iodination is a reaction where iodine is added to a double bond of alkene to give a diiodide. Alkene chlorination and bromination are very general reactions, and mechanistic study of these reactions provides additional insight into electrophilic addition reactions of alkenes. Much less detail is known about fluorination and iodination. 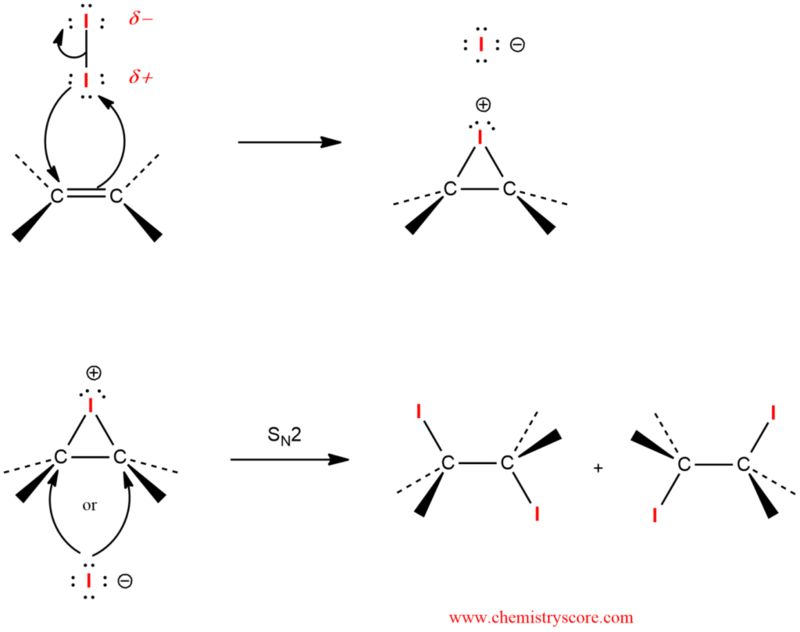 The order of reactivity is F2 > Cl2 > Br2 > I2. The differences between chlorination and bromination indicate the trends for all the halogens, but these differences are much more pronounced for fluorination and iodination. Fluorination is strongly exothermic and difficult to control, whereas for iodination the reaction is not normally favorable thermodynamically and easily reversible so often produces very low yields. But all of these reactions take place with a similar mechanism. Iodine is a highly polarizable molecule that behaves as electrophilic iodine (I+) in the presence of a suitable Lewis base, such as an alkene reacts with molecular iodine, a characteristic iodonium ion is formed, and subsequent reaction of addition the nucleophilic ion (I-) leads to the vicinal diiodide. In the second step of the proposed mechanism, the iodonium ion is attacked by the iodine ion that was produced in the first step. This step is an SN2 process and must, therefore, proceed via a backside attack. The requirement for backside attack explains the observed stereochemical requirement for anti-addition. The structure of this ion is rigid, and it may be attacked by iodide ion only on the side opposite the bridging iodine atom. The three-membered ring is thus opened stereospecifically. The leaving group is the bridging iodine. In symmetric iodonium ions, the attack is equally probable at either carbon atom, thereby giving the racemic (or meso) products observed.